"Star Trek: Voyager", The Da Vinci Room. Leslie Frankenheimer, with Community Outreach Committee Co-Chairman Phil Hoffman and Carol Kelley at the 2012 SDSA Awards Luncheon. 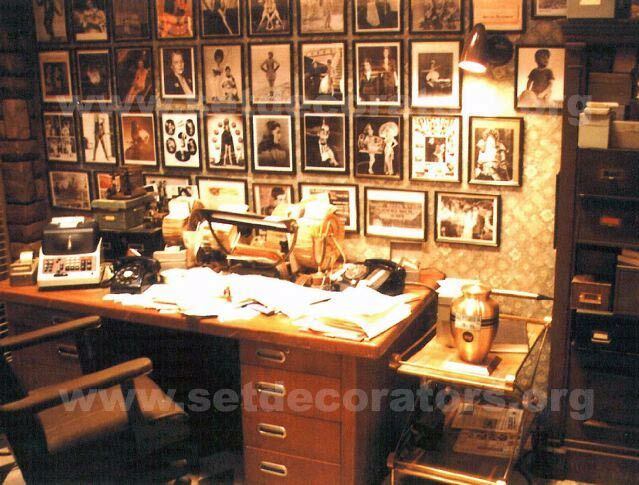 Acclaimed Set Decorator Leslie Frankenheimer SDSA died January 22, 2013. An Academy of Television Arts & Sciences governor, she served as an executive board member of both IATSE Local 44 and the Set Decorators Society of America, and most recently as co-chair of the SDSA Community Outreach. Frankenheimer earned four Emmys, five nominations. She stood firm for professional recognition and acknowledgement of the set decorator, with an openness and inclusiveness for all who strove for quality. A 2007 SDSA Spotlight featured Frankheimer, forthcoming, candid and delightful as ever. Enjoy the conversation with her below, and know she will be remembered fondly and with great admiration by many. My grandfather, Neil S. McCarthy, was an entertainment lawyer. One of his many clients was Cecil B. DeMille. When friends would come in from out of town my mother would take them to Paramount, and I was allowed to tag along. The sets were magnificent—everything in place and so character driven. 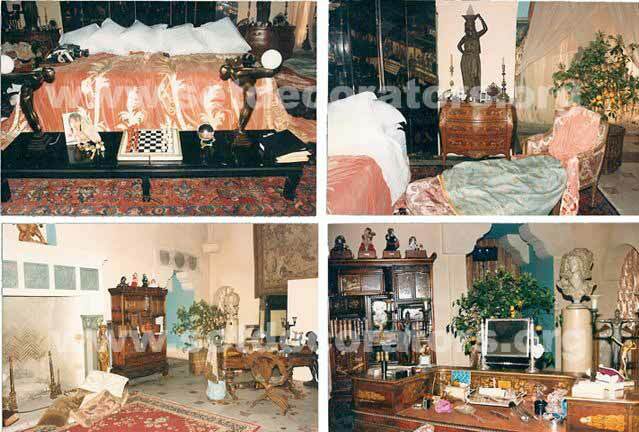 I remember how fascinating it was to see these rich rooms held up by unfinished wood and 2x4s! I was very young, but I knew these people were creating magic and I wanted to be a part of it! 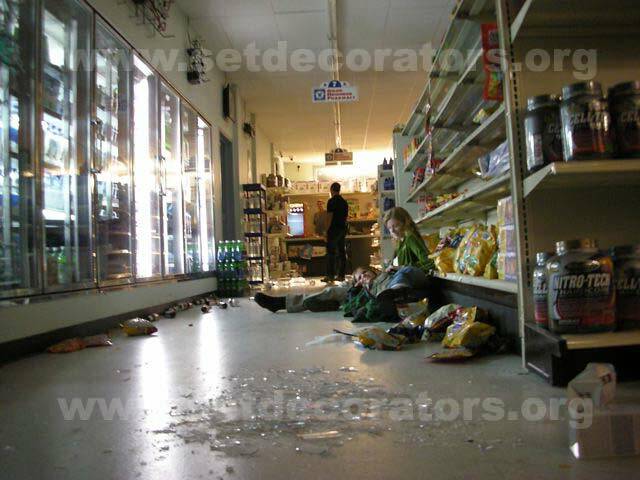 What type of education did you receive before going in to the field of set decorating? I was hired right out of Art Center to work for A.C. Martin and Associates, and then on to Morganelli Hume and Associates, both architectural engineering firms. 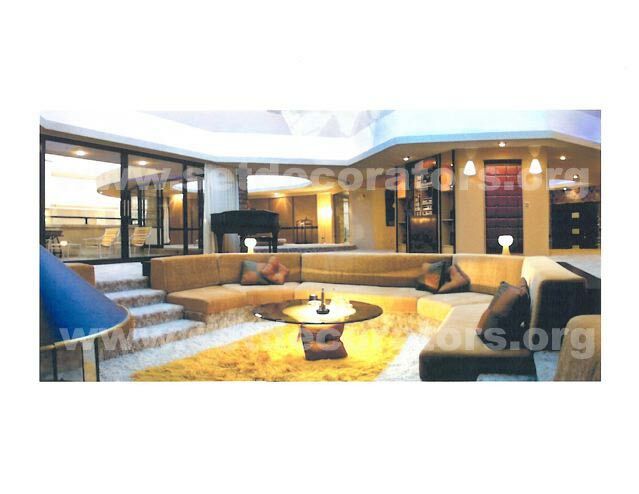 I did furniture layout and floor plans for A.C. Martin and worked on department store interiors for Moaganelli Hume. 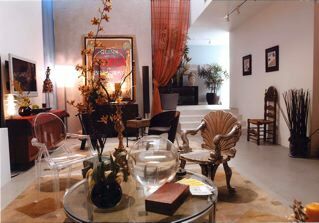 Next, the May Company hired me as their interior designer, and I also did window dressing for their home division. I then went to work as the account executive for Bel Vivere, an Italian furniture showroom on Beverly Boulevard. There I met Ruby R. Leavitt, the set decorator of films CHINATOWN, THE SOUND OF MUSIC, LOOKING FOR MR. GOODBAR and PILLOW TALK! I told her I was trying to get into the business. She introduced me Bill DeCinces in the art department, who told me someone would have to die before I could get on the books! I landed a non-union film, FALLING IN LOVE AGAIN with Michelle Pfeiffer, Susanna York and Elliott Gould. The director, Steven Paul, was only 21! In 1979, Universal was starting up a film called BLUES BROTHERS. I got a call from the art department that they needed a second set decorator. I met with Set Decorator Hal Gausman and Production Designer John Lloyd. I ended up getting the job because I dressed store windows! 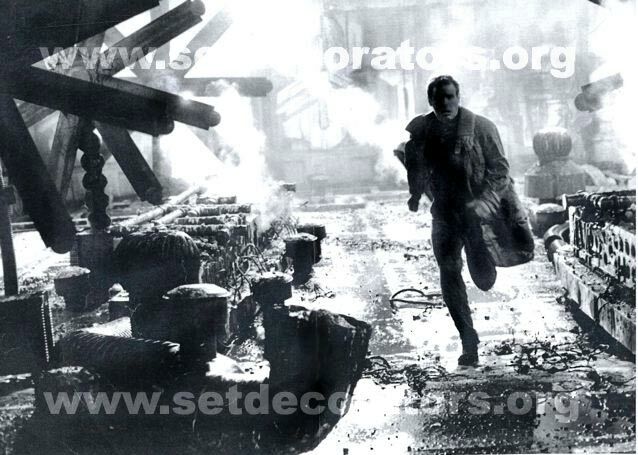 They needed a set decorator to do the whole shopping mall so Hal could concentrate on the main sets! Remember no matter how big or small your jobs are, put them on your resume…you never know! What sources would you say are the best tools for research and learning? Warner Research Library: It’s the best and so much fun! I could stay in there for hours. For JAMES DEAN, a TNT MOW, I found original set photos of Dean’s films. Since we had to duplicate a set from each of his films, they were a great help. In the Warner Bros. prophouse, I ended up finding some original pieces from the EAST OF EDEN film sets: the dining table and a Victorian side table from the living room set. I also found the original statue from REBEL WITHOUT A CAUSE that sat on the lamp table in his parent’s house, and the brass lamps from GIANT. All of this was made possible because of a well-stocked research library. When I finished the film, I had duplicates made of my set and research photos and gave them to library. It’s a wonderful thing to keep up the tradition! My own library: I have over 350 books and binders full of research sheets, and I keep adding more. Also, I’m on the book committee for the SDSA Marketplace and it is great fun choosing the books to make available for set decorators and production designers to purchase that day! AMPAS Film Library: It is such a great help to have so much at our fingertips. It was my second film and what a joy to do! Francis and Dean wanted everything to be completely real and in full working order. Every drawer had to be filled with the real thing and none of it new! I filled the kitchen drawers with aluminum foil that I had already opened at home, etc. I bought my crew new trashcans and hoses, and they brought in their used ones! Vittorio Storaro, the Director of Photography, wanted the audience to feel the emotion from the Teri Garr and Fredrick Forrest’s characters’ relationship, so he asked if I could line each lampshade in the color of the moment. I had 3-5 lampshades made for each lamp in their house! So when there was a fight, the cream lampshades that were lined in red satin were used...and the lights were brought up when they fought and lowered as they made up! 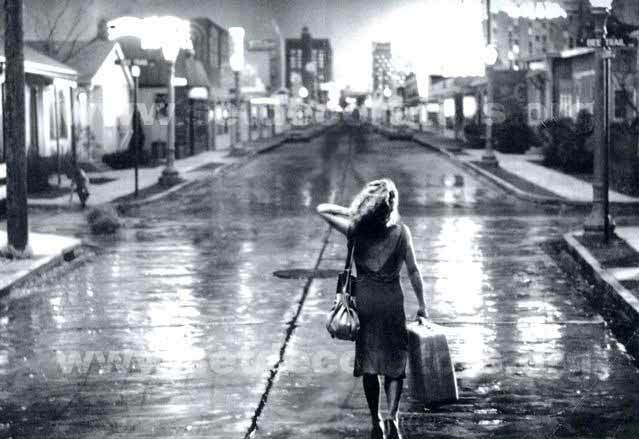 On the street exterior (all done on stage), the street had a vanishing point. As you walked towards the end everything got smaller…so much so that when you got to the end, the doors to the houses were no more than 5” high! I had trashcans, wind chimes, etc. made to fit with the proportion of the houses. The most challenging of all the sets was the junk yard where I had to go out and find vintage old car fronts and bring them back to life by getting them refinished and re-chromed, as well as new headlights! Then I had to work out with construction how to stack them on top of each other 4 cars high! We did it, and my favorite scene in the film is when the headlights turn on and light the set as Nastassja Kinski walked the tight rope! Rodrigo Garcia, our director, was so respectful of the set dressing and involved me in all his decisions. The characters are what made these sets so great to do! Each one had a strong, distinctive personality and their wagons were decorated accordingly. 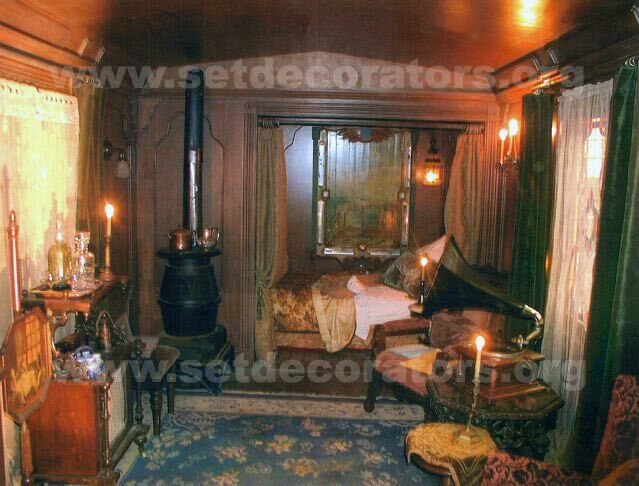 My favorite wagon was barely seen because it was lit only by kerosene, candlelight and natural light filtered through the tea-dyed lace curtains. The wagon belonged to a blind man who sees the future—another reason for the low lighting. On the back wall of his bed alcove hangs a beautiful painting on wood that I bought from John Daniel, in Pasadena, who collects music boxes. The painting came off of an old carousel and really made the whole set once it was hung. Wow! Where do I begin?!! The art and set dressing department drove MAX! We were so respected and given full control of the look by our incredible producer, Peter Wagg. Production Designer Richard Lewis and I worked closely to get the odd and eerie feeling throughout the whole show. MAX is set in the odd not-so-near future and was filled with dressing from yesterday! We use old 30’s and 40’s telephone receivers rather than more contemporary plastic because they would have lasted! All wiring went to the ceiling because the walls were no longer able to carry electricity. The future is very bleak. No one reads books. They only watch the television monitors that run 24 hours a day! Very few cars…more bikes and rickshaws were the choice of transportation…. 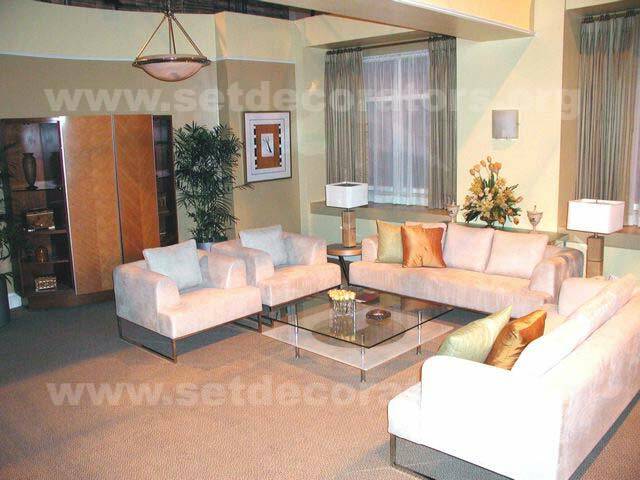 One of my favorite sets was Theora’s Apartment. The room was large, with 20’ ceiling and an old marble floor. For her sleeping area, I pushed 2 queen-size beds together and then went searching for a bedspread. I ended up in the drapery department at Sony. Because I had used most of my budget on the furniture, I had to be creative. I found exquisite peach velvet draperies with cream satin palm trees embroidered at the base, but I was told I could do nothing to them as far as cutting, etc., because they were from the Fred Astaire film FLYING DOWN TO RIO. I had the drapery department take out the French pleats and steam out the top. It took 2 pairs to drape the bed and I got a very expensive look for almost nothing! In our MAX HEADROOM future, there are very few trees and flowers left and what is remaining must be protected. In her bedroom were 6’ lemon trees and autumn leaves spread against the walls! Tom Walsh comes to the table with a “bible” of ideas and shares them with the director, DP, propmaster, and the set decorator. He fills a book with tear sheets and drawings of each character and their colors! We are all given copies and are then able to move ahead with confidence because Tom makes sure everyone’s in agreement before we spend one penny! On BUDDY FARO, Tom created amazingly detailed rooms with multi-levels, dramatic ceilings and curved walls wrapped in exquisite papers! Tom’s color choices are fantastic and it shows in all that he does! Steven Hendrickson is someone I have been privileged to work with on two projects, GRAMERCY PARK and KITCHEN CONFIDENTIAL. I have particularly included photos of some of those sets because we only did the pilot, which lost out that year to Tom’s show DESPERATE HOUSEWIVES! Steven comes from theater and brings wonderfully dramatic and unexpected ideas—and they all work so beautifully! 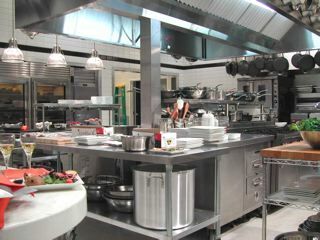 He designed the most handsome loft for our leading character on KITCHEN CONFIDENTIAL. Everyone fell in love with the empty room because he’s that great! I’m so lucky to have worked with these two gentlemen — and if you are ever called by either one, do not hesitate! The writers wanted a new “holodeck” and the decision was Leonardo de Vinci’s workroom! Talk about research! The Boston Museum had a de Vinci exhibit and we got all the books and drawings that they had to offer. I went over to see Ralph Fowler at Hollywood Studio Gallery, and we went to work! We were able to contact the museums that housed de Vinci’s work and obtained clearance—for a price. After I received the slides of the paintings, I had them blown-up and Ralph had them mounted on wood that was cut to the original size. He then matched paint to the art and brought out to the edge of the painting. (See photos). 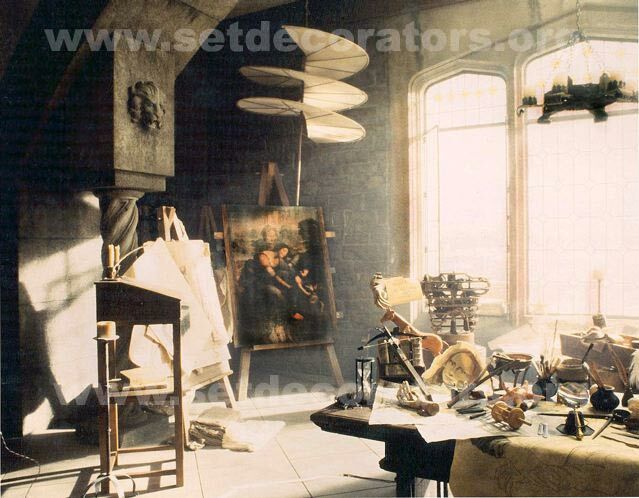 I had reproductions of most of de Vinci inventions made by the FX department at Paramount. I didn’t have room to build his airplane so I had a small model that we hung from the ceiling and 2 airplane wings that we leaned against the wall. I found parchment books bound in cream leather at the Heritage Bookstore on Melrose—not cheap, but so worth it! Also on Melrose, I found a store that sold me animal and rodent skeletons to place on the table along with fake human skulls and hands. Please list any SDSA business members with whom you do business and comment on them. Art Pic www.artpic2000.com: They have large oils, fantastic black and white framed photos and unusual metal, wood and barbed-wire sculptures. Marina Kieser does a great job rotating the art. And if you like an artist, she will keep you posted on his/her current projects! Hollywood Studio Gallery (323) 462-1116: Please see “Biggest Challenge” question above about Ralph Fowler. 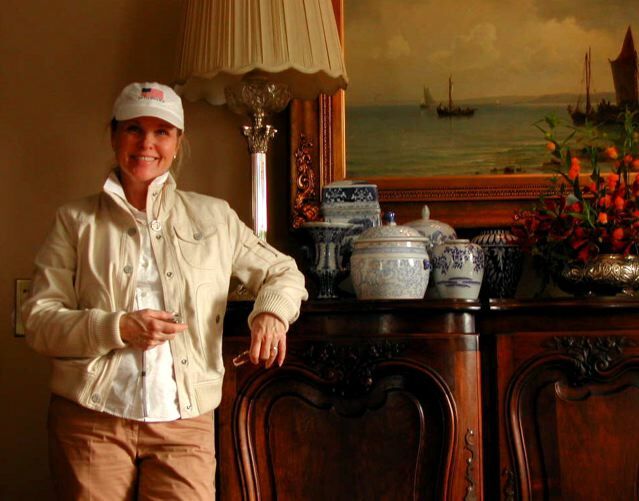 I also want to thank Tara [Set Decorator Tara Stephenson is the owner of HSG] and Ralph. They helped the SDSA COC by donating to our art sale over $6,500 of free framing!! We are so lucky to have them on our team! House of Props (323) 463-3166: Norm Balos & Phil Torf were so wonderful to work with. They really care about your budget. From the handsome Remingtons to the rich oil paintings, they have it covered. When I did the bearded lady’s wagon in CARNIVALE, I found the most perfect pieces for her dressing table there! Universal Studios Property www.universalstudios.com: Beverly Hadley’s door is always open to everyone. She loves to know what you want to emphasize and she really contributes. 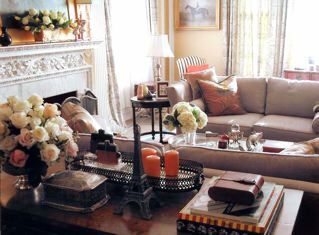 I love the character in each and every hand prop, the rich table lamps with silk shades and the many choices you get, like the seedy sofa from UP IN SMOKE to the French gold-leafed chairs made for THE PRINCESS DIARIES. Dave, in drapery, has a very talented group: I can always count on Kevin to come through, along with Fina, Joanne and the wonderful women who work their tails off, with a smile for everyone. Alfredo, in upholstery, is so helpful and cares so much about the finished product. Omega Cinema Props www.omegacinemaprops.com: Barry Pritchard runs a most special place and everything is in such good condition. I can find the best area rugs, furnishings from Victorian canopy beds to Knoll coffee tables and the most beautiful kitchen dressing from French brass scales to English plate racks! Lennie Marvin Enterprises www.propheaven.com: Lennie built this business from the ground up. I met him in 1979. He had a small storefront with the most beautiful antique iron toys and the finest train collections. From English phone booths to Gramercy Park lampposts, Dan Schultz and Keith Marvin have a toy box full of fun! Old Pine Furniture (818) 507-7077: I met the Brawneisens, at the Rose Bowl swap meet when I was prepping CARNIVALE for HBO. They have old hand-painted, stenciled furniture, faded and peeling—a perfect place to find dressing for the carnival wagons. Old leather trunks, tin cups, trays and bowls. They also have old mule wagons, vintage baskets and do a large business in custom pine furniture. It is family run and they are great to do business with. RC Vintage www.rcvintage.com: Willy Carter has stepped back in time and we love him for it! A ‘50’s dinner, neon signage, and the best collection of period restaurant lamps you could ask for. Old gas station pumps and the most extensive collection of ashtrays and snow globes! What are the contents of your car? I am very disorganized…But I got a wonderful gift two years ago that has kept me sane! It is a bag that hangs over the passenger’s seat and has pockets for everything you could imagine! Tape measures—one for myself and there is always someone who will need one, so I carry a few! Hold tags, masking tape, flash light, digital camera, Polaroid camera, 35mm camera, cell phone and charger, blank folders, blanket for late night shoots, thermos, CDs to calm the day, a case of water—you never know where you and the crew will be and water is important—tape recorder, packs of raw almonds, highlighters, lots of pens, pencils and steno pads…a must for me! What advice do you have for those interested in the field of set decorating (including those new and already in the profession)? Years ago my mother said to my 8 brothers and sisters and me, “Find something you love and find a way to make money at it!” I love getting up every day and going to work! I am doing what my mother wished and loving every moment! There are shows that are driven by Set Dressing rather than Art Department, which means you will work harder and longer hours. Bring that up in the negotiating and anything else you see as a problem BEFORE you take the job. Get whatever information you can on the deal they are going to offer your lead and buyer. It is not fair for them to consider job without knowing what is being offered. Do your own tagging look at what you are putting on your set. Don’t ever put your set in the hands of your lead or buyer and then blame them if it doesn’t work! Communicate with all involved—Director, UPM, Production Designer, Art Director, Propmaster—and make sure they do the same! Communicate well with your Lead and Buyer so they are not trying to second guess you. And don’t get upset if they have questions. Worry if they don’t have questions! They are trying to make it work for you. Treat them with respect. Don’t let anyone talk down to your crew and make sure your crew is respectful as well. Getting on a non-union show. Look in The Hollywood Reporter and Variety for lists of the TV series & pilots, and Films in production and in prep. Create a good resume with lots of references. Make friends with the production coordinator. Get their name and ask for him or her every time you check back to see if there are openings. Go to all the prophouses and get to know what they offer, and introduce yourself to the staff. Ask questions. 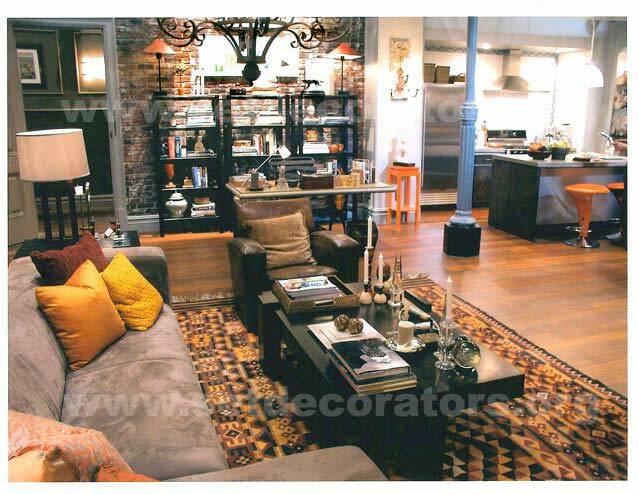 Go to every SDSA “A Day with Set Decorators” and get to know the decorators. Go to IATSE Local 44 and introduce yourself and learn the requirements to become a member. When you get on a show or film, be on time. Follow-through with whatever you are asked to do. Come back and ask, “What is next?” Remember there are 10 people waiting in line for your job. Be nice to everyone you meet no matter what they do…you will be remembered in a positive way. Enjoy the adventure! It’s a wonderful ride! The Lead person: The leader of the pack! In charge of picking the crew, their hours, trucks, pick-ups and returns. He/she must have good communication skills with crew, propmaster, locations, art department and, most important, the UPM! I could not do a good job without a happy crew, which means the Lead must have a sense of humor! Greg Renta has been my Lead, on and off, for over 18 years and the one thing that has made even worst days fun, is Greg and his great one-liners, and a very happy crew. The crew: They are as good as your Lead. If you pick a good Lead you will have a great crew! The Buyer: I did not believe in Buyers years ago, but having someone like Mara Spear changed my mind! “Product Placement” should be her middle name! Jeannie Gunn and I did the HBO pilot 12 MILES OF BAD ROAD, and Mara moved so quickly she had our heads spinning with all the deals she made! She also pulled fabrics and fringe with the wallpaper and paint samples we gave her. She found special items on Ebay and made deals for the art department and construction. When Mara goes out to find furniture, she takes photos and NEVER over tags!!! A good buyer is worth double their weight in gold! The Art Department Coordinator: He/she can save your relationship with the art department, construction and the UPM! The Art Department Coordinator watches out for all departments and ensures the charges go to the right person, tracks the budgets and gives out PO #s. A good coordinator can tell you where you stand on your budget at anytime. Propmaster Ken Johnston saved my life. By the time I got back from our set dressing truck with what little dressing I could find, Ken had filled the tables and walls with his own props. We added 2 chairs, a lamp and table and the set was saved! As I was walking by the producers trailer, they asked Greg and I to come in. As we entered they jumped all over us for telling the director that they changed the set! I lost so much respect for them and learned from it. What advice would you give members of the SDSA on how to get the most benefit from your membership? Join a committee!!!!! I loved being on the SDSA board and from there I met Mae Brunken, who was the head of the SDSA Community Outreach Committee. So when I was thinking of stepping down from the board, I said I want to be on Mae’s committee! I’ve never been so happy. I have a frustration with members who complain about how things are run, but never volunteer to change what they don’t like. Why do you join a group and then do nothing?!! The fun part is interacting with other members and meeting people you might otherwise never know. Set Decorator Leslie McCarthy Frankenheimer SDSA was both. The light that Leslie brought to everything cannot be duplicated. The skies are brighter now and heaven is getting a makeover! SDSA members and others are sharing their personal reflections about her on the SDSA Facebook page. Click here to read or contribute. Outstanding Art Direction for a Single-Camera Series for Carnivàle (2003). Shared with: Bernt Amadeus Capra (production designer), Jeremy Cassells (art director), Dan Bishop (re-shoot production designer), Roger L. King (re-shoot art director), Gary Kosko (re-shoot art director), Sara Andrews (re-shoot set decorator) (HBO). • For episode "Milfay" (pilot). Outstanding Art Direction for a Miniseries, Movie or a Special for James Dean (2001). Shared with: Robert Pearson (production designer), Marc Dabe (art director) (TNT). Outstanding Art Direction for a Multi-Camera Series for Emeril (2000). Shared with: Dwight Jackson (production designer), Ed LaPorta (art director) (NBC).• For episode "Halloween". Outstanding Art Direction for a Series for Buddy Faro (1998). Shared with: Thomas A. Walsh (production designer), Kim Hix (art director)(CBS).• For the pilot. Outstanding Art Direction for a Series for Max Headroom (1987). Shared with: Richard B. Lewis (production designer), Bernard P. Cutler (art director)(ABC).